Help us with our busy lesson load! Volunteers help us by bringing horses to and from their paddocks, helping our riders groom and tack, and by leading and sidewalking in our lessons! We are always looking for volunteers to help us feed, fill water buckets and muck paddocks in the evenings. This is a great way to learn about horse care! Want to help but not so interested in horses? Maybe you are better with a weed wacker, a can of paint or doing office work? We’d love to have you!! We always need help with facility maintenance or managing our files. THH holds several fundraising events every year. If you are good at events or fundraising, we could use your help!! THH is a registered community service agency. We are always looking for new people to help teach our kids. 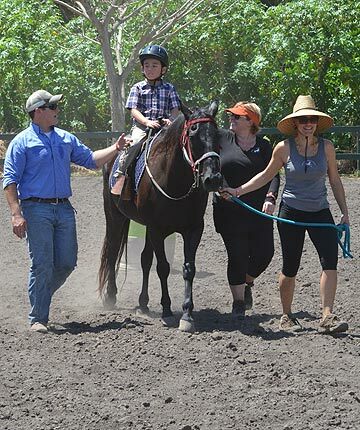 We are a certified Mentoring center and are happy to train you to become a Certified therapeutic riding instructor!" Volunteers must be at least 12 years of age. Exceptions may be made for current riders at THH or other barns. Volunteers must be physically and emotionally able to be safe around horses and follow directions of staff at all times. Working outdoors with horses is physically demanding. What you need to know to safely and effectively help out at the barn. Information we need to have to allow you to participate as a volunteer.